Athanasius of Alexandria (also spelled "Athanasios") (c. 296 C.E. – May 2, 373 C.E.) was a Christian bishop—the Patriarch of Alexandria—in the fourth century. He made three primary (and integral) contributions to the theory and practice of Christianity: an endorsement of the monastic lifestyle, the formulation of the New Testament canon, and a theological defense of the full divinity of Christ (against the position taken up by Arius). For these contributions to the development of the Christian faith, Athanasius is revered as one of the 33 Doctors of the Church by the Roman Catholics, is counted as one of the four Great Doctors of the Eastern Church, and is regarded as one of the greatest early leaders of the church by many Protestant sects. Further, he is also venerated as a saint by the Roman Catholic Church, the Eastern Orthodox Church and the Oriental Orthodox Church. There is modern criticism of Athanasius for his allegedly merciless way of treating the Arians who denied the divinity of Christ in favor of his humanity. It should be noted, however, that Athanasius himself never denied the humanity of Christ. So, a friendly dialogue between him and his Arian opponents could have happened, if he only had the mind and temperament to pursue it. Little is known of the pre-ecclesiastical life of Athanasius. It is often supposed that he was a child of upper-class parents, as the quality of his theology and scholarship (much of it written before his thirtieth birthday) clearly indicates the type of education that would only have been available to the relatively affluent. Regardless of his biological parentage, Athanasius soon developed a formative relationship with Alexander (the bishop of Alexandria), who saw in the young man the potential for spiritual greatness. Appreciating this potential, the bishop was motivated to enroll Athanasius in a private study course and to introduce him to the various ascetics living in the Egyptian desert. Under the bishop's paternal influence, Athanasius eventually became his patron's secretary and a deacon at the Alexandrian See. Some time between 318 and 328, Athanasius wrote a double treatise entitled Against the Gentiles—On the Incarnation, which argued for the validity and rationality of Christianity in a (nearly-outmoded) apologetic style, and also explored the relationship between God (the Father) and Jesus. That these works were circulated (and have remained extant into the present day) is as much a testament to the patronage of Bishop Alexander as it is to the quality of Athanasius's early literary output. Regardless, Athanasius's theological commitment to Jesus's divinity (in addition to his role as Alexander's secretary) led the young deacon to accompany his master to the First Council of Nicaea in 325 C.E., a council (ordered by Emperor Constantine I) whose goal was to formally resolve the question of Christ's divinity, in order to avoid schisms within the church. In doing so, he "was to deploy a triple onslaught based on the Church's living faith and experience. First, he argued that Arianism undermined the Christian doctrine of God by presupposing that the divine Triad is not eternal and by virtually reintroducing polytheism. Secondly, it made nonsense of the established liturgical customs of baptizing in the Son's name as well as the Father's, and of addressing prayers to the Son. Thirdly, and perhaps most importantly, it undermined the Christian idea of redemption in Christ, since only if the Mediator was Himself divine could man hope to re-establish fellowship with God. So great was the public profile of this young deacon (both in popular and theological circles), that he was a natural choice to succeed the well-respected bishop Alexander—an achievement that becomes additionally notable when one takes into account the fact that he had not yet reached the age of majority (30 years) thought necessary to hold such a vaunted ecclesiastical position. However, while the first four years of his episcopate were rather uneventful, the proponents of Arianism soon began to insinuate themselves back into the Christian community, eventually earning the ear of emperor Constantine. When Athanasius continued to speak against them as heretics, pro-Arian bishops began to foment controversies against the young bishop, accusing him of various crimes against the faith. Realizing that he would not receive a fair trial at the hands of the Arian synod surrounding Alexandria, he traveled to Rome to plead his case directly to the pope, who cleared him of all charges. However, this was just the beginning of Athanasius's tribulations. Over the next 43 years, he spent approximately 18 of them in exile, hiding from Arian supporters in the Imperial court, the local churches, and even, at times, the Vatican. Despite this, he remained consistently devoted to the Christological formulation defined at Nicaea and anathematized any who refused to acknowledge the divinity of Christ. During his various exiles, he traveled throughout Christendom, teaching the Nicene Creed and spreading the tales of the exemplary Desert Fathers (especially Saint Anthony). And now began that last period of comparative repose which unexpectedly terminated his strenuous and extraordinary career. He spent his remaining days, characteristically enough, in re-emphasizing the view of the Incarnation which had been defined at Nicaea…. That that confession did at last prevail in the various Trinitarian formularies that followed upon that of Nicaea was due, humanly speaking, more to his laborious witness than to that of any other champion in the long teachers' roll of [Christianity]. In addition to his profligate defenses of orthodox Christology (and his various attacks upon and defenses against the Arians), Athanasius also produced a number of additional, notable works. For example, he was instrumental in the development of the Catholic understanding of the Holy Spirit, writing a letter defending its divinity (Letters to Serapion) in the 360s, and delivering a polemic on the topic (On the Holy Spirit) against the Macedonian heresy. He also produced a biography of Saint Anthony (Vita Antonii), which was largely responsible for the spread of ascetic Christian ideals throughout the Eastern and Western halves of the Holy Roman Empire. Likely the most significant contribution Athanasius made to the development of Christianity was his staunch defense against Arianism (and his resulting support for the doctrine that God (the Father) and Jesus (the Son) share a common substance). In about 319, when Athanasius was a deacon, a presbyter named Arius began teaching that there was a time when Jesus did not exist and that he had been created by God - a view which came to be known as Arianism. This Christological formulation, which seemed to contradict some elements of Christian practice, soon polarized the entire Christian community. Soon, it seemed that a schism would rend the fledgling faith asunder, which prompted Emperor Constantine to call for a Ecumenical Council where the issue could be formally resolved. As described above, Athanasius accompanied Alexander to the First Council of Nicaea in 325, which produced the Nicene Creed and anathematized Arius and his followers. On May 9, 328, he succeeded Alexander as bishop of Alexandria. However, as a result of vicissitudes in official support for Arianism, he was banished from Alexandria to Tyre by Emperor Constantine I. Athanasius was alternately exiled and restored on at least five separate occasions, perhaps as many as seven. This gave rise to the expression "Athanasius contra mundum" or "Athanasius against the world." His tireless devotion to the Nicene orthodoxy (evidenced through his lifestyle and his various letters and publications) was likely one of the primary reasons that Arianism did not eventually hold sway over Christian thought. Athanasius is also the first person to formally identify (and canonize) the same 27 books of the New Testament that are in use today. Up until that point, the lists of appropriate works tended to vary throughout the Christian community. This milestone in the evolution of the canon of New Testament books can be found in his Easter letter from Alexandria, written in 367, which is usually referred to as his 39th Festal Letter. The import of this letter cannot be overstated, as Pope Damasus, the bishop of Rome in 382, promulgated a list of books which contained a New Testament canon identical to that of Athanasius. With the sanction of the papacy, this canonized list came to be recognized fairly quickly, with the support of a synod in Hippone in 393 and a synod in Carthage in 397 as additional evidence to this fact. The saint was originally buried in Alexandria, but his body was later transferred to Italy. In the recent past, Pope Shenouda III of Alexandria returned the relics of Saint Athanasius to Egypt on May 15, 1973, after his historic visit to the Vatican and meeting with Pope Paul VI. The relics of Saint Athanasius the Great of Alexandria are currently preserved under the new St. Mark's Coptic Orthodox Cathedral in Deir El-Anba Rowais, Abbassiya, Cairo, Egypt. 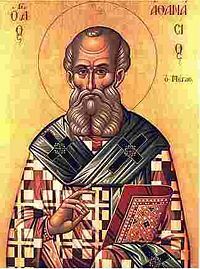 Some modern historians suggest that the tactics of Athanasius, while often downplayed by church historians, were a significant factor in his success. He did not hesitate to back up his theological views with the use of force. In Alexandria, he assembled a group that could instigate a riot in the city if needed. It was an arrangement "built up and perpetuated by violence." Along with the standard method of excommunication he used beatings, intimidation, kidnapping and imprisonment to silence his theological opponents. Unsurprisingly, these tactics caused widespread distrust and led him to being tried many times for "bribery, theft, extortion, sacrilege, treason and murder." While the charges rarely stuck, his reputation was a major factor in his multiple exiles from Alexandria. He justified these tactics with the argument that he was saving all future Christians from hell. Athanasius stubbornly refused to compromise his theological views by stating, "What is at stake is not just a theological theory but people's salvation." He played a clear role in making the Constantinian shift (i.e. the politicization of Christianity through its direct involvement with the ruling powers) a part of the theology of the church. However, there are also many modern historians who object to this view and point out that such hostile attitudes towards Athanasius are based on an unfair judgment of historical sources. As such, there are at present two completely opposite views about the personality of Athanasius. While some scholars praise him as an orthodox saint with great character, some see him as a power-hungry politician, or even a violent gangster, with both parties claiming to have strong evidence supporting their views. It should be noted that while Athanasius tirelessly worked in defense of the divinity of Christ, he never denied the humanity of Christ. He was never a docetic. Following the tradition of St. Paul and St. Irenaeus, he was aware of the importance of Christ's humanity as well as his divinity for the salvation of human beings. Given that, he could have at least partially appreciated the Arian assertion and stayed in dialogue with the Arians. ↑ Though some sources suggest that Athanasius may have been born as early as 293 C.E., certain facts (including his seeming lack of direct experience with the Maximian persecutions of 303 and the oft-described fact that he had not reached the canonical age (30) when he was first appointed as bishop of Alexandria in 328 C.E.) suggest that this date is unlikely. See Cornelius Clifford's article on "St. Athanasius" in the Catholic Encyclopedia for more details. ↑ Cornelius Clifford, "St. Athanasius," The Catholic Encyclopedia. Retrieved June 12, 2007. ↑ The earlier date is the more traditional and is argued for in Clifford, while the later date is suggested in Barnes's excellent and scholarly Athanasius and Constantius. ↑ J. N. D. Kelly. Early Christian Doctrines. (San Francisco: Harper & Row, 1978), 233. ↑ Clifford, "St. Athanasius," The Catholic Encyclopedia. ↑ Athanasius's issues with the papacy were primarily caused by his interactions with the anti-pope, Felix II, who had been appointed by imperial fiat in order to further an Arian agenda. ↑ The importance of Athanasius in the development of the New Testament canon is attested to in Alister E. McGrath's Historical Theology: An Introduction to the History of Christian Thought (Oxford: Blackwell Publishers, 1998), 28. ↑ Scholars have debated whether Athanasius' list in 367 was the basis for the later lists. However, because Athanasius' canon is the closest canon of any of the Church Fathers to the canon used by Protestant churches today many Protestants point to Athanasius as the father of the canon. They are identical except that Athanasius includes the Book of Baruch and the Letter of Jeremiah and places the Book of Esther among the apocrypha along with the Wisdom of Solomon, Sirach (Ecclesiasticus), Judith, Tobit, the Didache, and the Shepherd of Hermas. Excerpt from Letter 39. See the Biblical canon article for more details. ↑ Saint Athanasius. avarewase.org. Retrieved June 12, 2007. ↑ See coptichymns.net for more information. Also, the Wikipedia article contains an even more explicitly theological hymn, but it does not cite a source: "O holy father Athanasius, // like a pillar of orthodoxy // you refuted the heretical nonsense of Arius // by insisting that the Father and the Son are equal in essence. // O venerable father, beg Christ our God to save our souls. ↑ Timothy Barnes. Athanasius and Constantius: Theology and Politics in the Constantinian Empire. (Cambridge, MA: Harvard University Press, 1993), 230. ↑ Richard E. Rubenstein. When Jesus Became God: The Struggle to Define Christianity during the Last Days of Rome. (Harvest Books, 2000), 6. ↑ Roger E. Olson. The Story of Christian Theology. (Downers Grove, IL: InterVarsity Press, 1999), 172. ↑ Nathan K.K. Ng. The Spirituality of Athanasius. (Bern: Peter Lang Publishing, 2001), 273-292. Clifford, Cornelius. "St. Athanasius." The Catholic Encyclopedia (1907). Retrieved June 12, 2007. History of "Athanasius of Alexandria"
This page was last modified on 23 April 2016, at 20:35.